Imagine you are paddling along on a clear, breezy day. Suddenly, a flock of birds appears and lands on the water in front of you. Strange, you think. Then, BAM! A huge whale pops out of the sea headfirst directly in front of you, bumping your board and sending you careening to the side. Viviana Guzman doesn’t have to imagine. This actually happened to her. 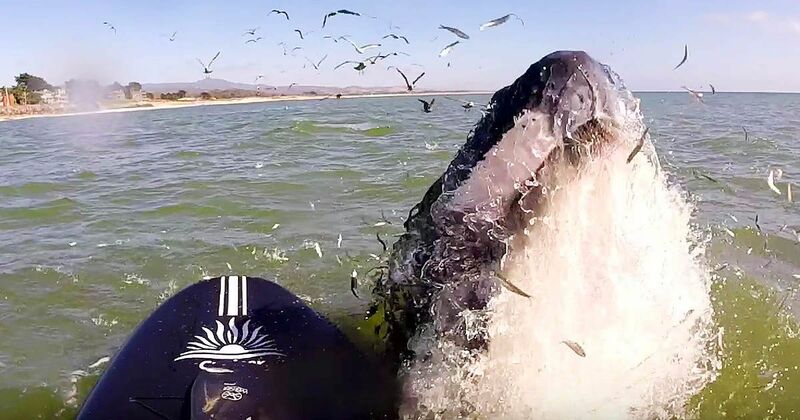 Guzman was paddle boarding just off the coast of Half Moon Bay, California, when a juvenile humpback whale leaped from the water to feed, bumping her board in the process. The whole thing was caught on camera, and you can see Guzman falling to her hands to steady herself. Guzman is a popular flutist who has performed in over 123 countries. The self-described “flute queen” writes on her website: “I play my flute for the whales, and they come!” The final scene in the short video below shows her kneeling on her board as she plays the flute, a curious whale breaching nearby. Whales don’t have ears like humans, but they might have heard Guzman’s flute. According to National Geographic, whales are specially equipped to hear underwater. Their “ears” are connected to their jaws, helping them to hear and locate sounds in their aqueous environment. How their hearing might work above water is less clear. Guzman isn’t the first musician to put on a performance for these gentle giants. In 1999, the City Cantabile Choir of Seattle used an underwater speaker system to serenade a pod of orcas. Though the whales didn’t dance to the tunes, they did attend. Nearly a dozen whales surrounded the boat at times, whistling to one another as the music played.